Distinguishing Characteristics Asian female. Black hair, brown eyes. Some agencies may refer to Ann Marie as Ann Marie Shaw and/or Ann Marie Godbey. She is of Filipino descent. 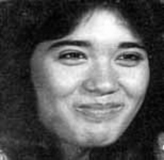 Ann Marie was last seen on December 3, 1995 in Manassas, Virginia. She has two children with her former boyfriend, Walter Thomas Godbey, an independent contractor. The couple never married, although Ann Marie often used his last name. Earlier in 1995, Ann Marie was granted custody of their children and Walter was ordered to pay child support. A photo of him is posted with this case summary. Walter claimed that she dropped their children off at his former residence on Oronoco Lane in Manassas on December 3. He stated that Ann Marie then traveled to the Philippines, where some of her relatives resided, to visit her mother. Her sister, Jewel Terry, said that she had an argument with her around the time Ann Marie was last seen, and the sisters were estranged at the time Ann Marie disappeared. She has never been heard from again. Walter was charged with the murder of Douglas Alexander Small, an America Online marketing director, in December 2001. He confessed to the killing shortly after his arrest. Walter shot Small to death after the men had an argument regarding Walter's renovation work for Small's Washington D.C. residence. Walter then moved Small's body to Alexandria, Virginia, where the remains were discovered a short time later. Walter was convicted and sentenced to thirty years in prison for the crime. Terry filed a missing person's report for Ann Marie after Walter's arrest. She told authorities that she did not contact law enforcement after her sister disappeared due to their disagreement. Terry said she suspected Walter was involved in Ann Marie's disappearance. She said his story that she had moved to the Philippines to be with her mother could not be true, because Ann Marie didn't have a passport and, in any case, her mother was dead. Walter's wife, Carla Godbey, was questioned by police and led them to Ann Marie's birth certificate, Social Security card, driver's license, credit cards and pictures of her children in boxes under the stairs in Walter's house. She stated Walter had confessed to Ann Marie's murder and had showed her the body while holding a gun to her head. She claimed Ann Marie's body was dismembered and the torso was buried in a wooded park in Fairfax, Virginia, but a search of the spot indicated turned up no evidence. After their interview with Carla, investigators went to question Walter in prison. He said Carla and Ann Marie got into an argument and a gun in his possession went off and killed Ann Marie accidentally. In November 2009, Walter was indicted for murder, robbery and unlawful use of a firearm in Ann Marie's presumed death. He pleaded guilty to involuntary manslaughter in her case in June 2010 and was sentenced to ten years in prison, on top of the thirty years he's already serving. Terry stated Walter had physically abused Ann Marie and she believes the sentence was too lenient, but investigators said they had no evidence to prove a premeditated murder. Updated 3 times since October 12, 2004. Last updated December 2, 2011; distinguishing characteristics updated.